Welcome to Amsterdam! An APT representative will meet you on arrival and transfer you to your luxurious floating home for the next 15 days. You’ll have time to unpack, relax and get acquainted with your ship, as the excitement builds for everything that’s about to come. FREEDOM OF CHOICE: Perhaps slow things down and cruise the canals on a glass-top boat. Maybe visit Zaanse Schans – the quintessential Dutch village known for its windmills and specialty produce. Or even sleep in and take the day as it comes. If you’re lucky enough to be on one of the spring departures, the tulips of Keukenhof Gardens are ready to greet you at every colourful turn. FREEDOM OF CHOICE: Take a discovery through Bonn’s historic city centre or set off on a bike to explore. FREEDOM OF CHOICE: A gondola ride over the Rhine Valley will give you the best perspective of the town. For something a little more quirky, Siegfried’s Mechanical Musical Instrument Museum houses fine automated musical creations. Otherwise, a selection of fine Rhine Valley wines eagerly await your palate at an onboard tasting. FREEDOM OF CHOICE: Pick up the pace and hike through a forested area overlooking Franconian vineyards. Or, go slow and head to a local cellar for a tipple or two. You can even stay on your ship and learn a little German. FREEDOM OF CHOICE: Enjoy a walk to the 18th-century Würzburg Residence. Or traverse the Romantic Road to Rothenburg. Maybe get to know the locals with a visit to a family-owned farm, with a home-cooked morning tea on the menu. The day is yours to design with a Freedom of Choice sightseeing inclusion. FREEDOM OF CHOICE: Perhaps journey through Nuremberg’s history with its Gothic churches and World War II sites. Or keep fit with a hike through the Schwarzach Valley. FREEDOM OF CHOICE: In Regensburg, explore its World Heritage-listed city centre. Or put on your dancing shoes for a Bavarian dance class at a local beer haus. Maybe take a culinary walk and visit the Michelin-starred Storstad. FREEDOM OF CHOICE: From Passau, head to Salzburg to visit some of the sights featured in Roger and Hammerstein’s The Sound of Music. Or set off into the Czech Republic, where Česky Krumlov awaits. Either way, re-board your ship in Austria’s Linz. Alternatively, explore the town of Passau, followed by a relaxing day on board cruising to Linz. Choose from a fabulous Freedom of Choice inclusions today. FREEDOM OF CHOICE: Visit the statuary-adorned Melk Abbey. Otherwise a local expert is on hand to show you around town. FREEDOM OF CHOICE: Perhaps take in the city’s many landmarks along the Ringstrasse, including St Stephen’s Cathedral. The 1,441-room Schönbrunn Palace and its gardens are a favourite. Or tick another country off your list and journey to Slovakia’s Bratislava. Otherwise, get active with a bike ride to Klosterneuburg Monastery. SIGNATURE EXPERIENCE: After dinner, head to the Family of Liechtenstein’s City Palace in the heart of Vienna, where APT have arranged an exclusive cocktail party and private recital, just for you. A full orchestra will perform classical masterpieces by Mozart and Strauss. You will also be enchanted by an operatic recital and some members of the Mozart Boys’ Choir. SIGNATURE EXPERIENCE: This afternoon, follow in the footsteps of Elisabeth of Bavaria (Sisi) and embark on an imperial train journey. Board your elegant Grand Empress steam train, where you’ll be treated like royalty, with a game lunch served. You will see inside some ornately adorned carriages from the early 1900s. Gödöllő Palace, Elisabeth of Bavaria’s favourite residence, is your destination. You will be shown through this monument of Hungarian aristocracy and architecture. Later, enjoy a Cocktail Reception at Budapest’s Royal Waiting Room before returning to the ship. Operates on all departures between May and September. Terms and conditions apply, all offers are subject to availability and operator booking conditions. All savings are included in the fares shown and were correct at time of print but are subject to change. Fares are per person based on 2 people sharing a stateroom. 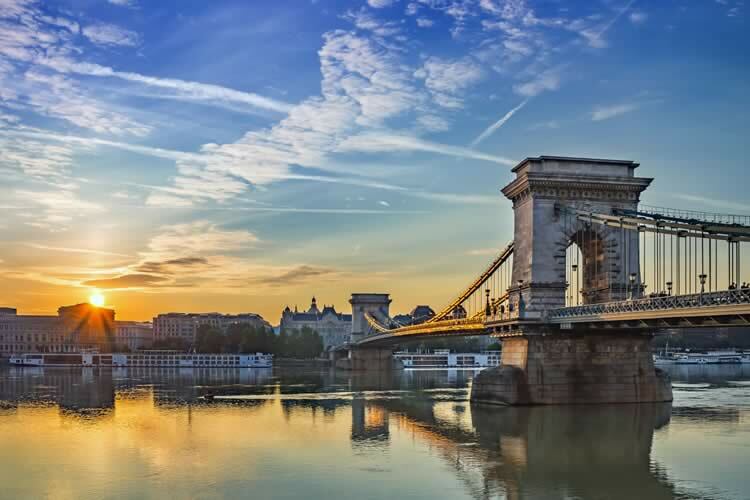 *Savings of up to £1,450 per person are applicable to new 2020 European River Cruises booked by 30th April 2019 or until sold out. ††Home pick up service is valid when booking within a radius of 75 driven miles from the UK departure airport. No cash alternative will be given. For journeys over 75 miles there will be an additional charge per car per mile. This service is only available for UK mainland. We charge a one-off small £20 booking fee. That’s it - nothing more and no add ons when you pay the balance. E&OE. ABTA P6710.